If Outlook does not start the email setup wizard automatically when it is opened for the first time, click on the File tab. Click on Info in the left margin, then click on Add Account. The dialog box will open with Email Account selected. In the Your Name field, type your personal name as you’d like it to appear to your correspondents. In the E-mail Address field, enter your email address and your password for that email address in the Password field and in the Retype Password fields. 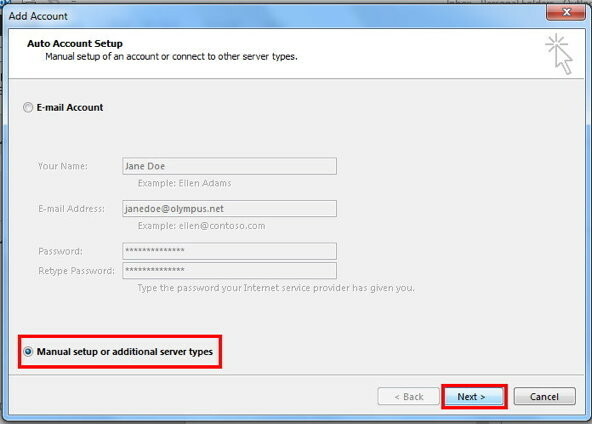 Below the password fields, click on the radio button to select Manual setup or additional server types, as shown in the screenshot below. Select Next. 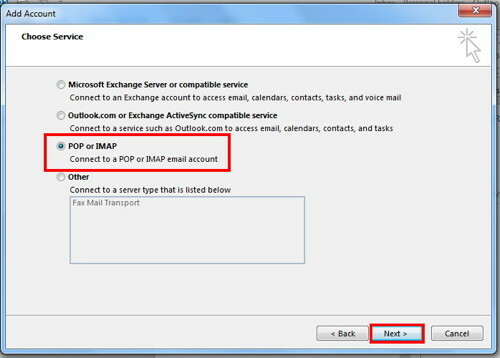 On the Choose Service dialog box, click the option for POP or IMAP. Select Next. Carefully follow the text below for the appropriate settings for your account to be entered into the fields marked by red rectangles in the screenshot following the text. For olympus.net email (janedoe@olympus.net): Enter mail.userservices.net in both in both Incoming Mail Server and Outgoing Mail Server fields. For email in your own domain (sally@example.com): Enter mailc11.megamailservers.com in both Incoming Mail Server and Outgoing Mail Server fields. 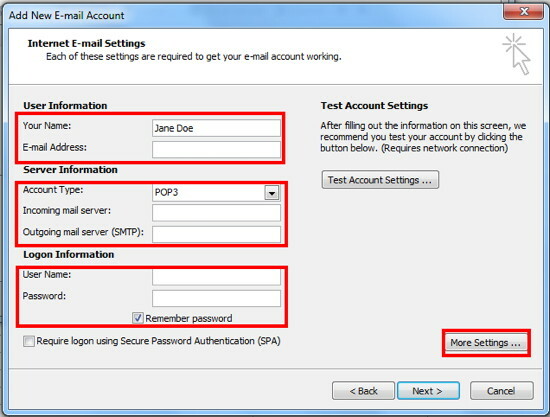 The Account Type can be POP3. Advanced users may use IMAP. Under Logon Information: User Name MUST be your full email address. Enter the password for the email address. The Remember Password checkbox should be checked. Click on the Outgoing Server tab. 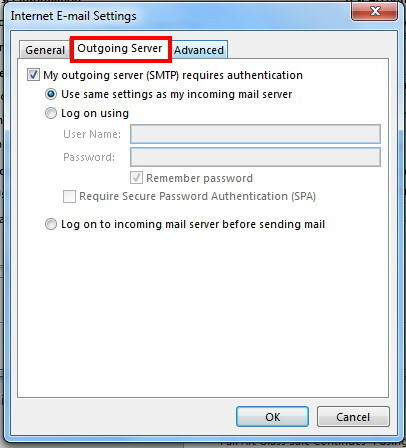 Check the checkbox My outgoing server (SMTP) requires authentication. Check Use same settings as my incoming server. If during the setup you are not presented with choices to turn on SSL or TLS, click on the Advanced Tab. 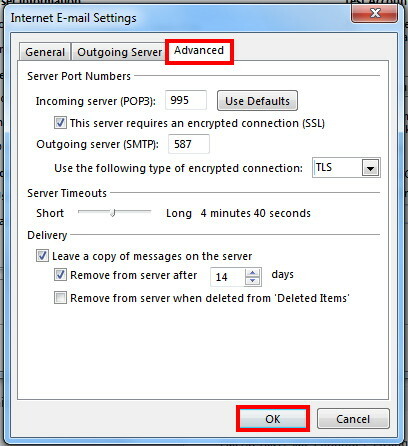 Check the checkbox to enable SSL, and select either TLS or SSL for the Outgoing Server in the dropdown menu. For the Outgoing Server, port 587 is preferred. 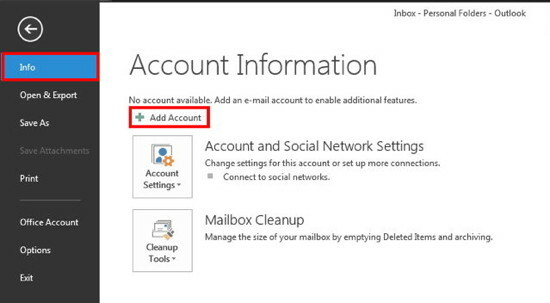 Click OK. Then click Next on the main settings dialog box, and Outlook will test your settings. Close the test dialog box, and then click Finish.